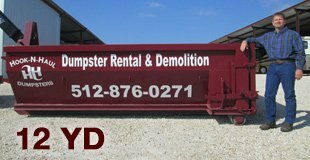 We are one of the few dumpster rental companies offering the 12 yard dumpster rental in Austin. The main reason for carrying a roll off dumpster at this size is because of all the tight spaces you have around the Austin area. This dumpster allows us to accommodate the customers who are working with a tight space but have just to much junk for the 10 yard dumpster rental. This is your next best choice, and alot of customers will upgrade to the 12 yard dumpster just to make sure not to go over the weight limit of our 10 yard dumpsters. 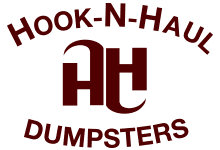 Our 12 yd dumpsters can hold a little more than 12 cubic yards of material and is an ideal choice for small-medium sized projects, such as remodeling or renovating a single room of your house. For anyone handling a remodel or renovation project on an average size home then look at this size dumpster first.